Having been in the market to buy a house in Boulder for over a year now, an article that was published in the 2/21/16 Boulder Daily Camera about the housing affordability crisis for middle-income households struck a chord with me. Boulder needs to find ways to allow for the growth in the number of houses that consume relatively little land, since land is so expensive. I would love to find an affordable attached townhouse or rowhouse in Boulder. Or even a condo over a store (so that the store is paying for the land). One thing I’ve learned/confirmed in my search is that way too many houses in Boulder have a very low walkscore. Such houses make the cost of housing very expensive in an indirect way, because the household tends to need more cars. It will be interesting to see if there is a decline in opposition to compact/dense housing, a decline in opposition to mixed use, or both, in response to the severe and growing housing affordability crisis in Boulder. A few factors keep some housing in Boulder fairly affordable: (1) proximity to very noisy and high-speed roads; (2) low walk scores; and (3) the many “modernist” houses in town (which tend to be ugly, unlovable places for many of us). Should Boulder Prohibit Bicycling on Sidewalks? 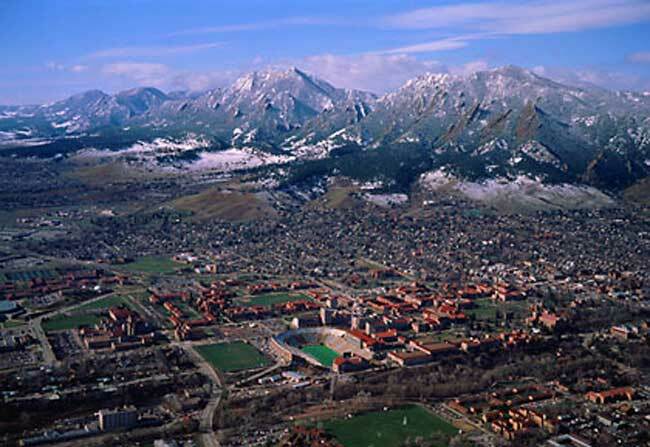 Boulder Colorado is well known for providing an impressive range of bicycling facilities. However, the City prohibits bicycling on several sections of commercialized streets. I have serious concerns about this prohibition. I should state first that I am very well aware of how poorly bicyclists mix with pedestrians on sidewalks – particularly sidewalks that are heavily used. An important reason for the incompatibility is that bicyclists and pedestrians have a very large speed differential, and pedestrians often move from side to side unpredictably. For these reasons, I typically tend to oppose bicyclists on sidewalks. I was a bicycle commuter in Florida for about 25 years, and I made it a point to almost never ride my bike on a sidewalk, and would strongly prefer it if I (and other bicyclists) NEVER had to be on a sidewalk. Professionally, I have spent much of my career strongly advocating that bicyclists not be allowed on sidewalks, and often argue with friends and others when I frequently hear the claim that bicyclists are safer (and belong) on sidewalks. I have always taken the position that bicyclists don’t belong on sidewalks. It is therefore highly ironic that here in Boulder, where bicycle facilities are extremely high-quality and abundant, I suddenly find myself riding on sidewalks almost every day I ride. Not because I prefer it, but because I feel forced to do so. There are two main reasons why, for the first time in my life, I am often riding on sidewalks. First, Boulder has a number of extremely important streets (streets that most all travelers understandably want to travel on frequently – that includes bicyclists) that are nearly impossible for a bicyclist to ride on – including for highly experienced, skilled bicyclists (I include myself in that category). These car-only, high-speed highways are exceptionally hostile to bicyclists. The main offenders are Broadway (particularly in the town center), Canyon, and 28th Street. Second, Boulder has a made what I believe is the very bad decision to convert a number of two-way streets to one-way operation in the town center. A growing number of cities are converting their one-ways back to two-way operation after discovering how toxic they have become to a healthy city and street. With one-way streets, bicyclists are presented with three extremely undesirable choices: (1) opt for a very inconvenient, out-of-the-way route that adds significant distance to the bicycle trip; (2) ride in the street against traffic (which is extremely dangerous); or (3) ride on the sidewalk. I typically opt for #3, even though I am well aware of the incompatibility-with-pedestrians problem. Given all of the above, I believe it is extremely problematic for Boulder to not allow bicycling on commercial streets such as town center Canyon and Broadway (or on one-way streets). By doing so, Boulder is taking the position that bicyclists are not allowed to bicycle on some of the most desirable, heavily used routes in the city. Only pedestrians and cars are allowed on those streets. While the regulation is a significant inconvenience for someone such as myself, it is much more inconvenient (and extremely discouraging) for the “interested but concerned” bicyclist that Boulder is now seeking to put special efforts into encouraging. Again, I tend to be strongly opposed to allowing bicyclists to ride on sidewalks. But when the Colorado Department of Transportation (and the City of Boulder?) opted to design town center Broadway and Canyon to be hostile, car-only superhighways (and opted to convert certain two-way streets to one-way), an unavoidable consequence (in my opinion) was to force the City of Boulder to take what is normally a very undesirable position (in some ways, a Faustian Bargain): allow bicyclists to ride on sidewalks on those exceptionally hostile streets. Building car-only Broadway and Canyon in the town center (as well as creating one-ways) makes such a policy nearly unavoidable, unless the City of Boulder wishes to significantly handicap or inconvenience bicyclists by not allowing them to ride along Broadway or Canyon in the town center. In sum, I believe that the regulation discriminates against bicyclists. I should add that I recommend allowing bicyclists on sidewalks with deep regret (for the reasons I mention above), which to me adds urgency to the need to, say, road diet Canyon and Broadway in the town center to make them Complete Streets, because in general, bicyclists do not belong on sidewalks. But until that day of reform for Canyon, Broadway, and the one-way streets comes, bicyclists should be allowed on the sidewalks of those streets. One of the most effective ways to create affordable housing in Boulder is to create more walkable, compact, mixed-use housing (what Boulder is now calling “15-minute neighborhoods“). On average, a car now costs about $9,500/year to own and operate. If a household is able to only have to own one car instead of two, or two instead of three — because compact neighborhood design allows such a reduction — those households would have almost $10K a year that could now be put into housing rather than motor vehicles. Personally, I could not afford to live in Boulder if I owned a car. A related, powerful affordability tool is to allow more housing where the price of the housing is unbundled from the price of the parking. Boulder Junction will be the first time that Boulder sees housing where the price of parking can be unbundled from the price of housing. Big savings, given how much parking (especially in Boulder) can cost to provide. In addition, the average parking space consumes something like 300 SF of real estate. The outdated, excessive minimum parking requirements that Boulder uses too often is making it impossible to build smaller, more affordable housing units on smaller lots, because so much space is needed for parking. We need to leverage this affordability opportunity by reforming parking regulations (mostly by converting minimum parking to maximum parking, and by making it easier to unbundle parking — or requiring parking to be unbundled). Boulder’s future will see a growing number of Millennials, and we know that demographic group (more so than earlier generations) is looking for more walkable, compact, mixed-use housing where the need for a household to own 2-3 cars is less necessary. Does Boulder provide enough of that type of housing for the coming growth in demand (and a more sustainable world where car ownership is less necessary and less affordable)? I don’t believe it does. An equitable, healthy community provides the full, adequate range of housing and lifestyle choices from urban to suburban to rural. In my opinion, Boulder has a mismatch of such choices. There is an oversupply and relative under-demand for drivable suburban housing. Conversely, there is a large (and growing) demand for compact, walkable housing, and a very scarce supply of such housing in Boulder. Increasing the number of unrelated adults who can live in a home, as well as easing up on accessory dwelling unit and co-op housing restrictions, are very important affordability tools. And one that causes relatively little neighborhood disruption. Neighborhood compatibility and neighborhood objections to new development are highly contentious in Boulder. Perhaps the most fundamental building block I know of for creating neighborhood compatibility (not to mention creating the much desired, yet elusive vision for Boulder and its neighborhoods) is to implement charrette-driven form-based coding, instead of the vision-less, conventional, outdated zoning-based coding that Boulder uses. An excellent example of the power of form-based coding is the code created by Dover-Kohl for North Boulder and the Holiday neighborhood. I believe that now is a wonderful time for Boulder to either adopt form-based overlay zones in targeted areas, or to engage in a citywide, perhaps incremental, replacement of conventional zoning codes with what are called Smart (form-based) codes. Such codes not only incorporate detailed, inspirational visions and compatibility tools (and most importantly, uniquely significant neighborhood buy-in), but are effective (when appropriate) in creating compatible compact, human-scaled, lower-speed and mixed use development that induce civic pride and powerfully achieve important City objectives. I am worried that actions taken by Council on the Comprehensive Housing Strategy might lock certain parts of Boulder into a highly undesirable status quo. There are many areas, such as East Boulder and important transit nodes, that are in desperate need of re-development — places that are overly car-happy, declining, parking lot-choked areas with a terrible economic and quality of life problem. These places, in particular, are overdue for restoration through catalysts such as the needed reforms to land development and parking that I outline above. In sum, the Comprehensive Housing Strategy offers the City an excellent opportunity to implement the reforms I outline above. There will ALWAYS be a large number of folks in Boulder who passionately advocate for and desire to live in compact, walkable neighborhoods. There will ALWAYS be a large number of folks who desire more dispersed, drivable suburban neighborhoods. And there will ALWAYS be a large number who want an isolated, rural lifestyle. How do we meet these three different lifestyle needs? For over a century, most communities — including Boulder — have unfairly believed that there is a one-size-fits-all approach to community design. And land development regulations too often reflect this unfairness. No, what is needed is not to find an impossible “consensus” amongst those seeking differing lifestyle paths (a recipe for a dumbed down, lowest common denominator plan). In my opinion, one huge solution is for Boulder to adopt what is called a “Smart Code.” A Smart Code includes an “urban-to-rural transect,” where land development regulations are calibrated so that a quality urban lifestyle is achieved in the areas designated as compact and walkable, where another set of regulations are calibrated to achieve a quality suburban lifestyle, and a third set of regulations is adopted to achieve a quality rural lifestyle. The transect concept asks this question: What elements are immersive in the habitat we are working in—be it Charleston or the Everglades? For example, the transect instructs that a sidewalk is immersive in Charleston, and a “transect violation” when within the Everglades. Conversely, a 200-acre marsh is immersive in the Everglades and a transect violation in Charleston. In other words, something is immersive if it promotes the quality of the habitat being designed. It is a violation if it harms the quality of the habitat being designed. And frankly, this is where some of the conflict and impatience comes between those who are currently the loudest: many Better Boulder advocates and many with PLAN-Boulder County. A good number of PLAN-Boulder advocates don’t seem to have a conception of a transect or immersiveness. To such advocates, it is always a good idea to incorporate more nature, larger setbacks, and lower density everywhere—which fails to acknowledge that a 200-acre marsh in the middle of an in-town urban neighborhood harms the quality of a walkable Charleston. Natural features are not always immersive in all locations (it took me a while to realize that, since I came from an environmental academic background). Conversely, many Better Boulder advocates are guilty of not taking proper care of sensitive ecosystems in projects they support. That more density, or taller buildings, or smaller setbacks are always appropriate in all locations. But it is also true that a many environmental scientists are guilty of not taking proper care of urbanism in their advocacy. Both advocacy positions (urban or suburban) can harm the other if not applied where it belongs. Let the city be a city and let nature be nature. It goes both ways. It has been accurately stated many times in Boulder that there is very little coherent “vision” for Boulder’s future in its Comprehensive Plan or its land development regulations. This is certainly true for Boulder’s largely conventional land development regulations, which utterly lack any vision. Instead, the regulations only tell us what we DO NOT want. The result, as we see, is unpredictable, often random, often unloved development — development that is certainly worrisome and opposed by many neighborhood groups. A Smart Code effectively addresses this lack of vision, as well as the equitable need to provide lifestyle and housing options for the full range of community desires — from compact to rural. It does this by not only adopting a code that varies as it moves from urban to suburban to rural, but also by incorporating a “Form-Based Coding” system, which is in stark contrast to the conventional zoning used in much of Boulder. Instead of the conventional, use-based codes that are found in most all of Boulder — a code that is mostly concerned about what happens inside of buildings, only tells us negatively about what is not allowed, and strives to avoid any mixing of housing with retail, services, or offices — a Smart Code with form-based coding reduces the excessive concern about what is inside a building (by separating uses from each other with such regulations, the use-based conventional zoning makes it much harder for Boulder to achieve crucial transportation objectives). A form-based Smart Code also provides us with a predictable, neighborhood-supported, positive vision for future development in neighborhoods. And that predictability and neighborhood buy-in is not only a wonderful way to reduce opposition to development, but is also a great way to ensure economic health (predictability is very important for business). Our regulations can show developers the building appearance and location on the property that the community and neighborhood desires in a given part of the “transect,” rather than the conventional use-based zoning, that only tells us what NOT to do. In my opinion, Boulder should use this highly contentious debate over future development as an opportunity to call for the development of a form-based Smart Code — either in targeted locations such as what has already been done in North Boulder, or citywide. This code should be developed in a “charrette” process (intense, community- or neighborhood-based design workshop facilitated by trained professional urban designers). A charrette is an excellent way to provide community design education to citizens, as well as to achieve a great deal of citizen/neighborhood buy-in (because citizens end up making many of the design decisions). The North Boulder Sub-Area Plan and the Holiday neighborhood within that location (prepared by Dover-Kohl consultants in the mid-90s) represents an excellent local model for a form-based Smart Code that has delivered popular, quality development. I understand that the plan and regulations remain popular after almost 20 years of adoption of that plan and its Smart Code. I continue to believe that five stories generally makes sense as a maximum height for a smaller city such as Boulder Colorado. I wouldn’t be rigidly opposed to taller buildings, but I think taller buildings in Boulder should be extremely rare (and probably clad in brick or stone to reduce the jarring nature of a relatively tall building). Besides the human scale that is lost when a building gets taller than five stories, there are other important concerns I have. Speaking from experience (and particularly in a city such as Boulder where transit service is good but not great, as it is in many big cities), when a building has a lot of stories, it is very likely that there will be an enormous amount of financial, political, and employee/resident pressure to serve that building with massive surface parking lots, monstrous (and monstrously expensive) parking garages (and underground parking). There will, in other words, be huge expenses associated with storing the huge number of cars, and the taller building will therefore be drawing a rather large number of cars — which is generally not good for a relatively small city or a place that seeks to be walkable. Relatively tall buildings can generally avoid this problem if served by very frequent bus or rail transit. In addition, that huge influx of cars can put a LOT of pressure on local and state government to add a lot of toxic, ruinous roadway capacity to the existing street system in order to serve that influx of cars — not at all good for a small city wanting to be walkable. Monster roads and monster parking is deadly to efforts to create walkability. It is probably true that a given city can only expect to support “X” number of jobs or housing or retail space. I think it is much preferable for a city that wishes to be walkable, vibrant and interesting to have, say, 50 buildings that are five stories tall than to have 25 buildings that are 10 stories tall. Aesthetics (including properly proportioned windows) are extremely important in this discussion. We’ve given density a very black eye by allowing aesthetic atrocities when density is attempted in the US. Excessive focus on size/height distracts us from the important, necessary discussion we need to have about design and details. This reminds me of a similar issue: Too many in Boulder are convinced that putting a cap on the number of people in Boulder is the be-all-and-end-all of protecting quality of life. Too many think that such a cap is all we need to create or protect the lovability of Boulder. I very much like the idea of making structured parking more common, and agree with how taller buildings can do that. Taller buildings create needed concentrations for transit nodes. I love the idea known as “inclusionary upzoning,” which makes affordable housing more economically, legally, and politically feasible. For walkability, I want to see as many buildings as possible (which taller buildings might work against). I want to see surface parking prohibited in places intended to be walkable. I want to see lenders stop demanding excessive amounts of parking for taller buildings before they agree to lend money. I want to see the price of structured parking unbundled from residential units. I want to see building setbacks minimized and “open space” or landscaping requirements relaxed substantially in places intended to be walkable. I want to see minimum parking regulations converted to maximum parking regulations. I want a requirement that parking be priced. I want to see a form-based code. And I want to see Floor Area Ratio limits raised substantially. Oh, and I also want to enact a moratorium on street/intersection size, and a cap on the total amount of parking in various districts. Many in Boulder claim that the City engages in “punishing” drivers. By contrast, I’ve been shocked by how PAMPERED drivers are in Boulder. And by how many “environmentalists” in Boulder are supportive of such pampering. Many greens here wrongly think that free-flowing traffic and the oversized roads and intersections that result from that) reduces air emissions and fuel consumption. It is actually the other way around. They forget about induced demand and low-value trips. By joining with the sprawl lobby in Boulder, they have created a very car-happy community. Drivers in Brooklyn or Amsterdam are maybe “punished.” But not in Boulder. If anyone is “punished” in Boulder, it is pedestrians and cyclists. Certainly there is a fair amount of lip service paid to pampering pedestrians and cyclists, and “punishing” drivers, but the reality is light years from that. 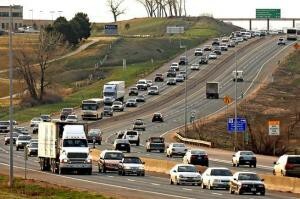 Is Tolling a Good Idea for US 36 between Denver and Boulder? For any major travel route within or between reasonably healthy cities, it is nearly inevitable that such a route will become congested – particularly during rush hours. This is because cars consume so much space that only a few motorists are needed to congest a road. How much space do cars consume? On average, a person sitting in a car takes up about 17 times as much space as a person sitting in a chair, and up to 100 times as much space when the car is moving. That is an enormous amount of space, and explains why so many cities are suffering tremendously from the disease I call GIGANTISM. Gigantic streets, gigantic intersections, gigantic parking, and gigantic sprawl are the inevitable result of a form of travel that eats up a huge amount of space. Too many communities have made the mistake of thinking they can provide enough space for these space-hogging cars by building over-sized facilities that destroy a sense of place, among other terrible outcomes. Over the past century, analysts have learned there is an Iron Law of Traffic Congestion. This inescapable law informs us that you cannot build your way out of congestion. You cannot widen a highway enough to eliminate congested conditions in the long term. Indeed, many studies have confirmed that a wider highway becomes congested about five years after the widening. As the adage says, widening a road to eliminate congestion is like loosening your belt to eliminate obesity. Widening a highway quickly leads to congestion because in a relatively healthy region or community, there is a great deal of latent demand for travel on that route. When congestion is eased (temporarily, I might add), many who formerly avoided driving the route at rush hour now flock back to driving the route at rush hour. Formerly, these newly-created (induced) motorists were discouraged from driving on the congested road at rush hour due to the inconvenience of congestion. Such people opted to use a different route, travel at times other than rush hour, or opted not to make the car trip. Now, with the newly widened highway, such discouraged motorists are “induced” to return to the highway to enjoy the less congested conditions. Congestion therefore re-appears very quickly. Studies also show that providing even high quality transit will not ease congestion, as the motorists who leave their cars and use transit instead are merely opening up new highway capacity that induces other motorists to start using the highway. The new space is created by the motorists who are now using transit. An additional problem that highways face is that when they are free to use, they inevitably attract what are known as “low-value” car trips. That is, a person often rationally decides that it would be acceptable to drive to a shopping center on a major road at rush hour to buy a cup of coffee. Since roads are so terribly expensive to build, maintain, and widen, such trips are not affordable for a community to support with its tax revenues. Finally, a great many car trips are occurring because motorists are so heavily subsidized. The few user fees we have, such as the gas tax, pay only a small fraction of the total cost to build and maintain our road system. And since nearly all car trips end at a “free” parking spot, motorists are also heavily subsidized when they park. Most of the money for car travel comes instead from such things as sales taxes, property taxes, and income taxes that we ALL pay – even those of us who don’t use a car (or use a car very rarely). For parking, the cost of “free” parking is hidden. How many of us realize that we are paying for the “free” parking by paying a higher cost for groceries, services, and other products purchased in retail centers? Since bicyclists, pedestrians, and transit users, and rare car travelers are also paying these higher costs, those making frequent car trips are, in particular, being subsidized. Ruinously, like so many other subsidies, subsidizing motorists mean that there are more car trips occurring than would occur normally had the subsidies not been in place. Subsidies encourage many people to make more car trips than they would have otherwise. Given the above, are there any effective ways to durably reduce congestion over the long term? The most effective, fair way to reduce congestion over the long term is a toll, whereby the motorist pays each time he or she drives on the road, and pays an amount that is calibrated to keep congestion at bay. As Donald Shoup says about parking, this toll amount is best based on the “Goldilocks” principle. That is, the toll should not be too high, as too few would use a road that the community spent a lot of money to build. The toll should not be too low, otherwise it will be over-used to the point of congestion because it will attract too many “low-value” car trips. Instead, the amount of the toll should be “just right.” An amount that creates a level of traffic that is considered tolerable by the community. What are the benefits of tolling a highway such as US 36? First, tolling allows the community to start to create fairness in how much we pay for car travel. By tolling, a higher percentage of the money needed to build and maintain the road is paid by the users – motorists. Without a toll, as I noted above, those not using US 36 at all (or only rarely, or only at non-rush hour times) are paying almost as much as those who regularly drive on US 36. This is patently unfair. Tolling therefore increases fairness by having motorists pay more of their fair share. Second, tolling is one of the few things – besides a “time tax” such as congestion – that can discourage “low-value” car trips. Again, building a highway that has enough capacity to accommodate low-value car trips is unaffordable. Third, tolling creates a “willingness to pay” dynamic that an untolled road fails to do. Since some trips are more valuable than other trips, it is important that we create a road system that allows a person to pay if they are willing to do so to avoid congestion. A person that is running late to reach a job interview should have the option of paying a toll to avoid congestion. An untolled road does not provide that desperate person with such an option, and instead offers the same level of access to the road as the person who is making a low-value car trip to buy a cup of coffee. It is clearly unacceptable for a person making a higher value trip to be delayed by a person seeking a cup of coffee. Tolling therefore acknowledges that there are certain trips that are more valuable than others. Fourth, tolling creates a significant amount of new revenue that can be used to build higher quality bus or rail service (which especially benefits lower-income individuals). The Denver-Boulder region, as well as the State of Colorado, have long had an enormous shortfall in needed transportation revenue due to such factors as a gas tax that is too low (it has not been raised for several decades, despite inflation), and the fact that most revenue comes from sources that ignores how much (or when) a person drives a car. Mostly, these sources are sales tax and property tax. By contrast, user fees are able to account for higher levels of car travel. The new toll revenue can be used to provide more transportation options for lower-income (and other) groups, by dramatically improving transit quality. Without the toll revenue, state and local governments will not have anywhere close to the amount of money needed to provide quality transit in our lifetimes. Fifth, because free roads and heavily subsidized motorists are artificially induced to travel much more than they would in a more fair system (ie, one that was based on user fees), residents in the Denver-Boulder region are being induced to drive a car excessively. Doing so dramatically increases greenhouse gas (global warming) emissions, fuel consumption, suburban sprawl, strip commercial, and extreme levels of car dependence that significantly degrades the quality of life of the region. Sixth, untolled roads significantly promote the profits of huge corporations such as oil companies, road builders, automakers, and builders of sprawl housing. Why? Because such free-to-use roads create such high levels of car use that citizens are inevitably compelled to pay a lot of money to such corporations as a necessary part of their subsidized, car dependent lifestyles. Seventh, by artificially inducing citizens to drive more often due to subsidies, our region is artificially reducing the number of trips that would otherwise be made by walking, bicycling or transit. Why? Because over-providing for car travel creates what economists call a “barrier effect.” The barrier effect is one where non-car travel occurs less often because excessive car dependence makes walking, bicycling and transit use too dangerous or inconvenient. Eighth, tolling allows the Denver-Boulder region to avoid the failed, ruinous, financially bankrupting path that other parts of the nation have followed. That path is road widening (loosening their belts to eliminate obesity). It is the path that the Colorado Department of Transportation first proposed for US 36: To create a monster highway 10 lanes in size. Fortunately, wise and tireless efforts by leaders in the region over the past 10 years succeeded in allowing the Denver-Boulder area to avoid that grim, mistaken path. Instead, a much more affordable and effective plan has been adopted: Retain the two free, untolled lanes in each direction, and create a new, tolled (“managed”) lane in each direction that is priced to maintain free-flowing bus rapid transit travel, as well as carpool travel. Free-flowing single-occupant vehicle travel is also provided for, because those willing to pay money to avoid the congestion are able to do so (again, that option does not exist on an untolled road). Happily, toll revenue from single-occupant vehicle travel will substantially supplement the extremely depleted coffers of our transportation departments, which gives us a near-term ability to provide the quality bus and rail transit we strongly desire.